Antigua and Barbuda is a Caribbean nation that consists of three islands: Antigua, Barbuda, and the uninhabited island of Redonda. The country is considered part of the Leeward Islands group in northeast Caribbean and is notorious (or perhaps celebrated) for its “Caribbean” way of life, which is characterized by laidback leisure, friendly and mellow people, and folks passing their day in palm tree shade sipping fresh pineapple and coconut juice. This Caribbean nation is also famous for its numerous beaches, claiming to have one beach for every day of the year. It is these white sandy beaches, washed by crystal clear water, lined with seashells, dotted with palm trees, and altogether basked in the warmth and radiance of the sun that attracts thousands of tourists each year. Antigua and Barbuda and its three islands were originally inhabited by Amerindians and later the Arawaks who were eventually displaced themselves by the Caribs at around 12th century AD. Christopher Columbus was the first European to land on the island in 1493 on his second voyage. However, the first to colonize the islands were the British. They set up sugar and tobacco plantations. Slaves were imported from Africa to work the fields and were subjected to harsh conditions. Eventually, slavery was banned and abolished in 1834. In 1981, Antigua and Barbuda became an independent country, though it remains part of the Commonwealth of Nations to this day. 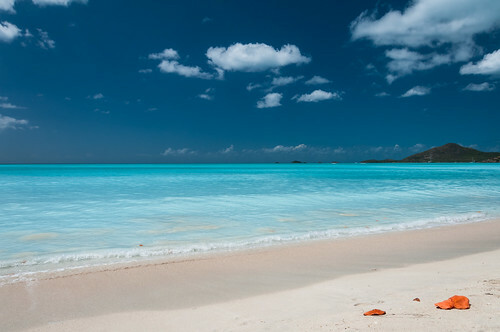 Beaches and water define Antigua and Barbuda and what it has to offer. The tropical fish and underwater corals provide a playground for watersports enthusiasts. The Nelson’s Dockyard and English harbor are popular spots, the scene of much yachting and sailing. Wildlife observing is another attraction of the country. There are national parks in Antigua and Barbuda that host wild deer, diverse insects, and tropical birds. The Frigate Bird Sanctuary boasts a number of exotic birds. The Devil’s Bridge is a “must” natural attraction. Located in northeastern Antigua, it is the site of Indian archaeological remains as well as a geologically natural limestone arch that has been carved over the years by the sea and Atlantic breakers. Cultural and historical attractions in Antigua and Barbuda include the Museum of Antigua and Barbuda in St. John’s, which traces the story of the islands and exhibits artifacts and objects recreating the nation’s history and culture. The Betty’s Hope Sugar Plantation in the limestone district of Antigua gives visitors a glimpse of a 17th century plantation which was once the scene of torturous labor for many slaves. Besides the attractions, be sure to leave room for leisure time so that you can enjoy the local music and dances, barbecues, rum and fruit punches, and nightlife that Antigua and Barbuda is known for.